CGTTypically used in small flow nitrogen applications where noise is not an issue. Reciprocating (or commonly referred to as piston) air compressors are positive displacement units, which means they increase the air pressure by reducing its capacity. Meaning air is taken in and compressed to a much smaller volume in a confined space and increasing this air to elevated pressures. 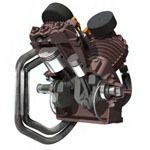 This is accomplished by a piston within a cylinder creating compression and displacement. Energy efficiency: Reciprocating/ piston compressors are highly energy efficient. Unloaded power consumption is eliminated by using simple start/stop control. Durability and reliability: With the reciprocating/ piston compressors, simplicity and reliability are built in. The compressor has a minimal number of moving parts, insuring a long operating life with a minimum number of service interventions. These compressors are time proven and built to last.